One of the most useful types of play for kids especially in terms of developing their divergent problem-solving skills, self-regulation skills, and counterfactual-reasoning skills is make-believe or pretend play. This kind of play helps children prepare for the different roles that the world may expect of them once they grow up as adults. It is therefore crucial to choose the correct pretend play toys to help bring out the best in children especially in terms of their cognitive, social, and emotional development. In our most recent update, we have raised the bar even higher limiting our list of the "Best Pretend Play Toys" to only 10 toys, cutting the previous list in HALF! That means the toys listed below have to be the best of the best to make our list this time around. Each and every toy featured in this article is sure to help your child's imagination continue to grow and blossom! 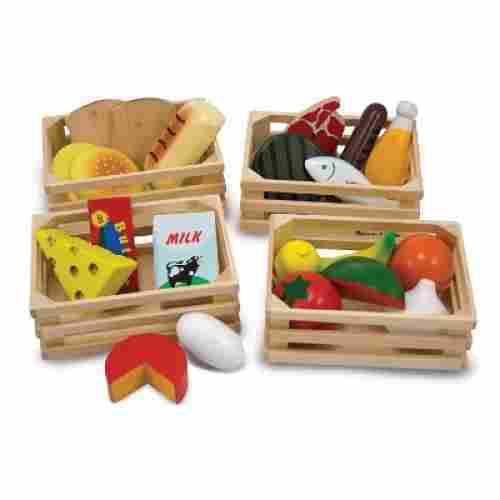 What better way to teach kids about the different food groups than to give them the Food Groups pretend play toy? 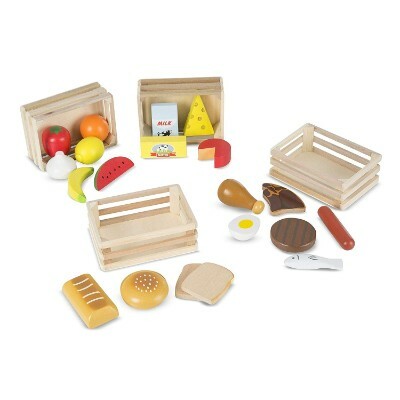 This wooden playset comes with 4 beautifully crafted crates for dairy foods, meat and fish, grains, and fruits and vegetables. Each tray comes with several pieces of representative foods for each group, all of which have been meticulously hand-painted for realism. Let Melissa & Doug spark creativity and cognitive learning with these realistic looking and colorful food pieces. They can pretend to work at a store, grocery stand, or combine with a cooking set to become a restaurant owner or many more play time scenarios. These pieces encourage relationship building and sharing among siblings and friends. Kids can learn cooking and nutrition vocabulary, build on fine motor skills, learn about displaying and sorting. The creative and learning possibilities are endless. One of the essential cooking skills that children may need to learn is food preparation especially in the slicing, dicing, cutting, and chopping of ingredients. 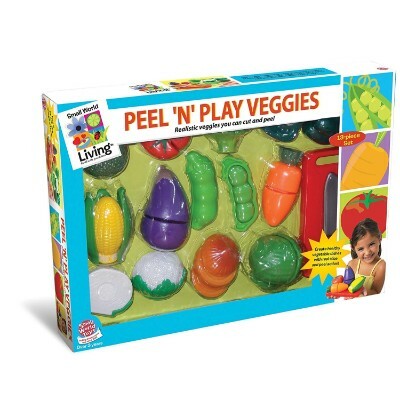 With the Living – Peel ‘N’ Play food playset, your kid will now have the chance to hone his knife skills paring, slicing, and cutting toy vegetables on a realistic cutting board. 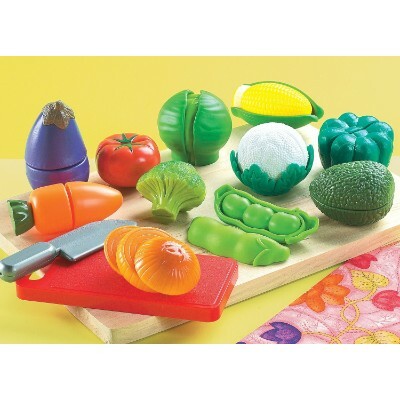 Included in the set are a carrot, a cauliflower, lettuce, broccoli, tomato, eggplant, peas, corn, green pepper, and avocado. Your kids watch you cut meat and peel veggies almost every day. So when they open up this gorgeous box of vegetables, they may know how to cut already. But they can do more than just cut. They could add the cut up veggies to a pot or skillet to be cooked, pile all the veggies into a shopping basket or cart, or set them up in a line and name them. Grasping the veggies and pretending to cut them with the knife will increase your child's hand-eye coordination and fine motor skills. Part toy and part learning lab, this delightful play set includes everything that your little one needs to feel like a real scientist. 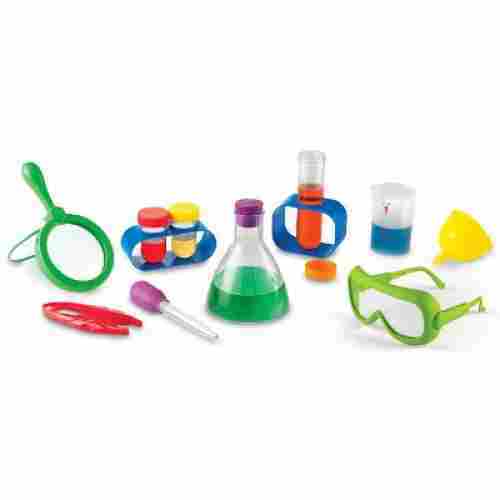 Beakers, test tubes, droppers, and even goggles made of high-quality and durable plastic await your child’s eager anticipation. 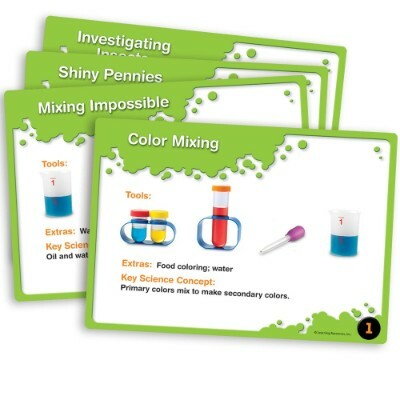 This kit goes a step further by including 10 double-sided activity cards that encourage them to use their toy science lab to perform real experiments, with parental supervision of course. All of the experiments are designed to be easy-to-follow, simple, and entertaining activities that utilize commonly found household objects such as vinegar and pennies. While some reading is necessary to follow the steps, each card also visually represents the pieces required to complete the experiment allowing pre-readers to follow along easily. With a bounty of pretend and real science play at their fingertips, your budding scientist will be able to take their first steps into the world of learning with this set. 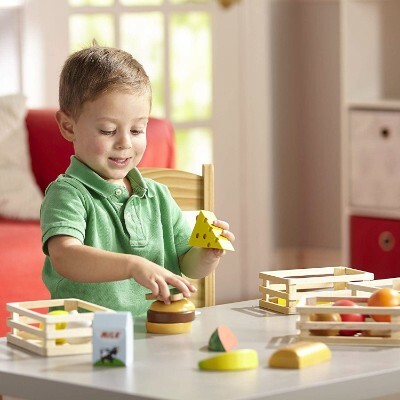 Cognitive and physical-skill development abounds with the science lab play set. Manipulating the small objects like the tweezers and the eyedropper is a fantastic way to bolster hand-eye coordination and build fine-motor skills. The activity cards help bring a STEM learning-style play to this set by introducing age-appropriate terminology and fun experiments which teach everything from color recognition to weight distribution. This encourages problem-solving skills and critical thinking. 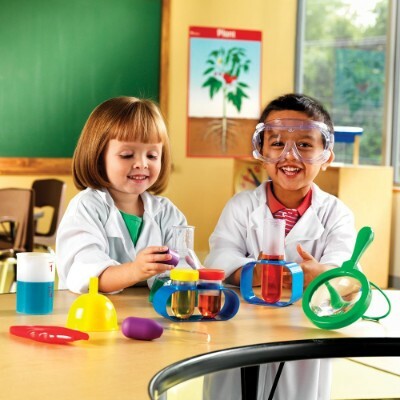 Outside of the experiments, the beakers and goggles will make your little one look and feel like a real scientist, providing a positive outlet for adult emulation and self-confidence building play. 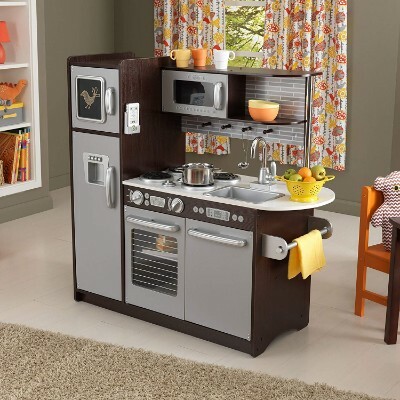 For the ultimate in kitchen management, you may need to get your kid the Uptown Espresso Kitchen pretend play set. This is one of the bulkiest pretend play sets we have seen so far. It stands a little over 40 inches and comes complete with a kitchen sink, a 4-burner electric stove with an oven, a microwave oven, a refrigerator with ice maker, and a freezer. There’s also a dishwasher just under the kitchen sink. All kitchen appliances and fixtures can be opened and shut. The countertop is made of an innovative speckled design. There’s also a cupboard that can double as a spice rack and kitchen cabinet above the kitchen counter. This is a wonderfully big toy kitchen set that will provide hours of fun and laughter for the little chefs in your family and their friends. 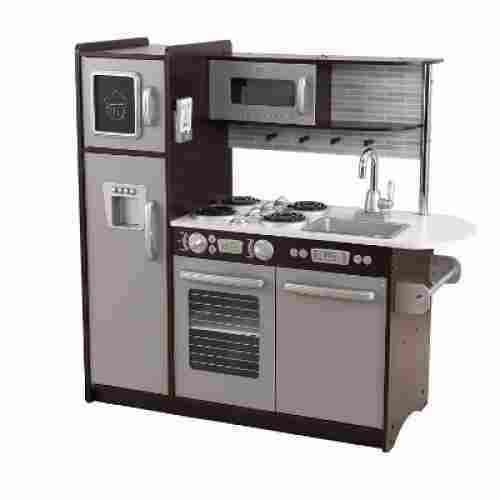 It’s big enough for several children to play together, learning parts of the stove, refrigerator, and oven. There is a microwave, a phone, and even a chalkboard mounted on the fridge so they can learn about writing numbers and letters. Children can form new relationships, learn how to play together as a team, learn organizational skills, creativity, and much more. Pink and pretty, yes. Fun and useful? Thumbs up for sure. 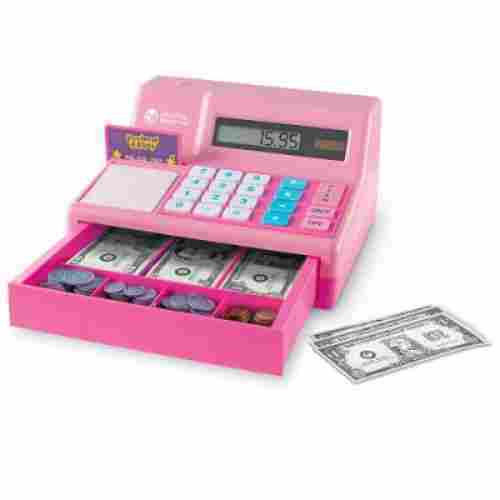 This pink pretend cash register is designed with a solar activated LCD screen. Along with the register, your child will receive 30 pretend bills, 40 plastic coins, an activity guide, and a pretend credit card. 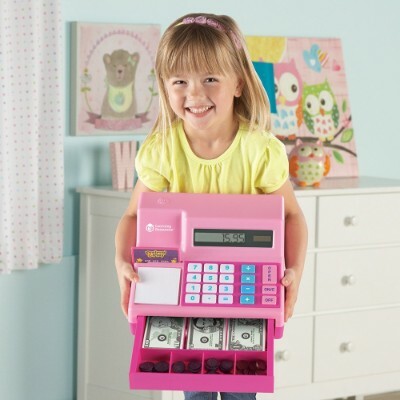 Kids love playing with cash registers, shopping, handing out play money, counting bills. Let your child’s creative mind take off. It will run a mile a minute. She’ll push the buttons, fine-tuning her hand muscles. We bet your kids will enjoy pushing the “Open” button, feeling a little rush when they figure out the cause and effect relationship between the push and the drawer opening and ringing at the same time. The great thing about cash registers is they support a whole bundle of skills that kids need to learn as they mature. They learn how to solve problems and overcome challenges during pretend play. We can encourage them to play with others, creating new friendships. So kids get help figure out how to deal with people and solve conflicts. They learn how to control emotions in a more mature way. Kids have fun playing shopping and working the register, learning about paper money, coins, and credit cards. The register even has a slot to slide the card. The Learning Resources School Set can’t replace traditional education of course but it may help make that transition into a school environment a little smoother for everyone involved. 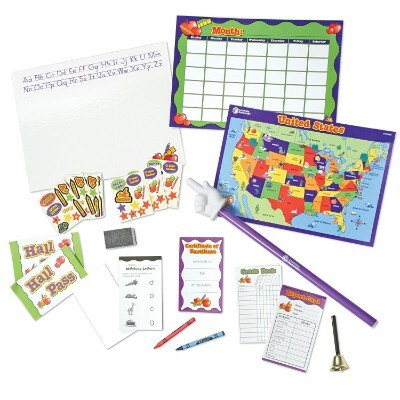 This adorable play set comes with a massive assortment of school-themed items from accomplishments stickers to a world map and even a bell to indicate the start of class! 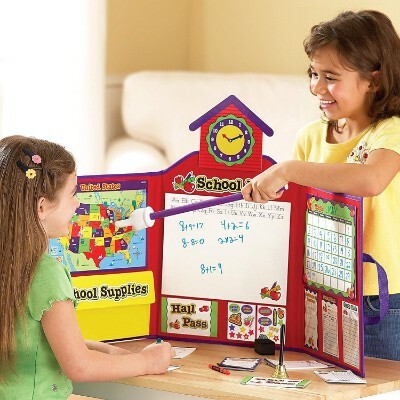 The board itself is a tri-fold design that utilizes a dry-erase-style board and accompanying crayons to give your little one an opportunity to practice writing their letters and numbers. All of the stickers, crayons, and worksheets fit neatly inside the attached school supplies pouch and an exterior velcro latch keeps everything closed and secure when not in use, making this an ideal car or travel toy. Children love to play school. With this set not only can they enjoy playing but they can also become more prepared. Going to school in some form or another is very important to the mental and social development of children, beyond just what they will learn from books. 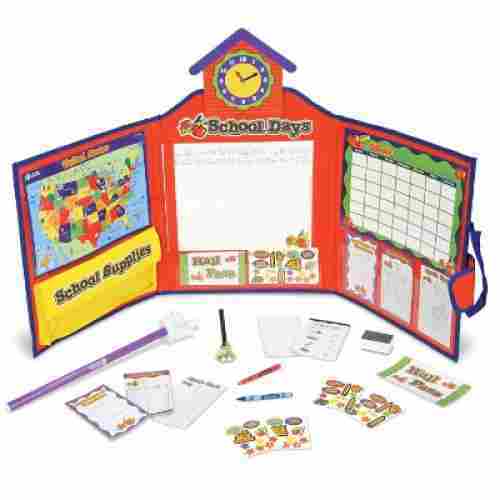 This set can introduce many early concepts of school learning such as worksheets and report cards, which can help encourage school readiness. Completing the worksheets, learning from the world map, and practicing writing skills are all great ways to encourage social interaction, problem-solving and critical-thinking skills. Manipulating the small pieces from the crayons to the stickers will also strengthen fine- and gross-motor skills. If you want to teach your kids about patience and perseverance, you need to get them to start learning to love the art of fishing. 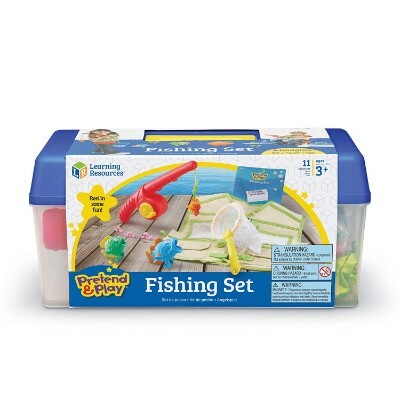 With the Learning Resources Pretend & Play Fishing Set, you can help create a hype in your kid about the joys of fishing. 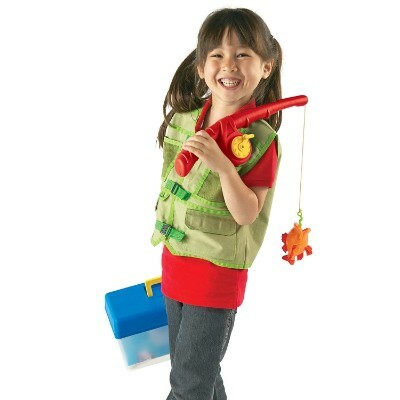 The set comes with a realistic angler’s vest complete with multiple pockets to simulate storage of baits and tackles. It also features a fishing rod and reel, a fish net, 3 worm baits, 3 colorful fishes of different sizes and colors, and a very useful activity guide. The whole set can be conveniently stored in a fishing box kit for easy carriage. Fishing is guaranteed fun, especially if you have a friend to share it with. A lot of bonding and camaraderie can happen on a shore with a few fishing poles. Kids can share whopping fish stories, help each other bait the hook, and pull in the catch! This is pretty cute with the colorful fish, and it even has worms. This set gives kids the time to exercise their motor skills, communication skills, enhance vocabulary, and most of all, catch fish! 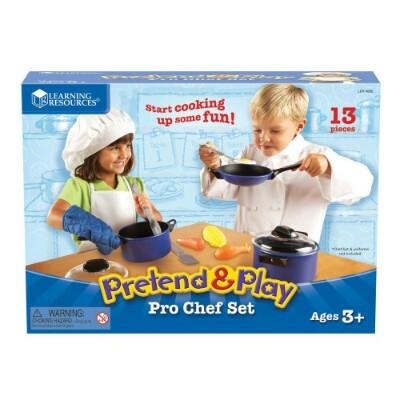 If you think your kid has what it takes to become the next Masterchef Junior, then you might want to give him or her the Pretend & Play Pro Chef Set. 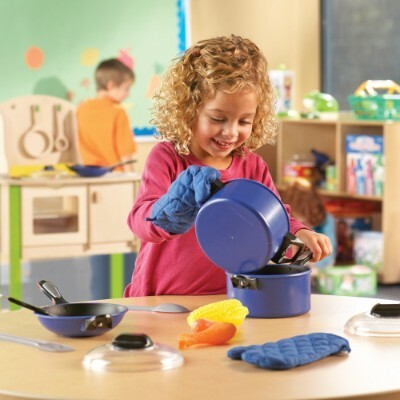 This award-winning play set comes with about 13 pieces of cookware and other accessories including a skillet, a saucepan, and a stock pot with 2 lids. The play set also comes with an oven mitt, a spatula, a wooden spoon, and 4 food items including a chicken drumstick, a carrot, corn, and fried egg. The Pro Chef set also comes with a unique activity guide for tons of absolute kiddie cooking fun. 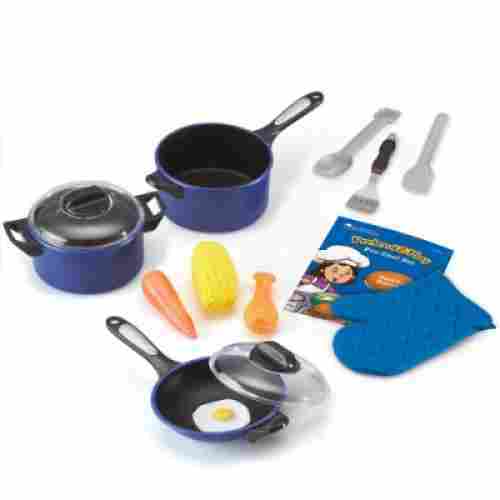 The Learning Resources Pretend & Play Pro Chef Set is an awesome and realistic looking cooking set that may inspire your child to become a gourmet chef. Or maybe just have some fun and learn how to role play and pretend along the way. It helps little hands develop fine motor skills, teaches cooking vocabulary, and inspires and teaches kids to learn how to problem solve and play together nicely. The dish set has a look of realism, so it’s exciting for kids to use them. 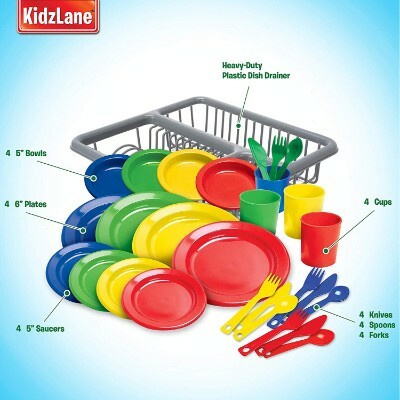 Your kids will be able to learn so much when they set up their new and colorful kitchen dishes next to you as you wash and dry your dishes. 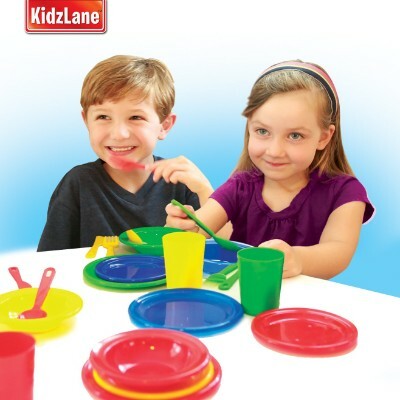 The dishes are from Kidzlane, a company dedicated to helping kids grow and mature all while they are having fun and being entertained. The dishes are described as being durable. They are full of fun and color. The embedded colors are in the primary range, so they seem to jump off the dishes and into reality. Children are eager to pretend and do what Mom does, so they will wash dishes, dry them, put away, and then set the table for another meal. Kids learn new skills by imitation. They enhance verbal skills as they learn the names of each dish. Kids engage in problem-solving, trying to fit bowls in the rack, or when they have a conflict with another child. Children learn while having a great time. Grooming is an essential aspect of one’s daily activities of living. With the Pretend Makeup Essential Set, your little girl will now have the chance to use a mess-free and totally fake makeup set. The playset already comes with lip gloss, glitter pot, blush, and eye shadow as well as real makeup brushes, a shatter-proof mirror, and a cosmetic bag. All of the toys are for pretend play only and as such do not pose any risk of applying any form of substance on your kid’s skin. 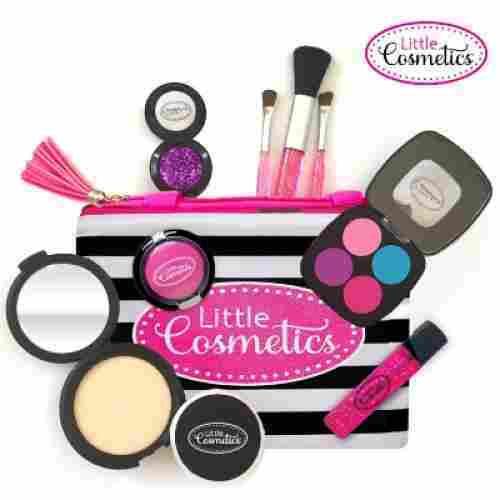 The little make up artist in your home will love this realistic looking makeup set. There are colored pads inside the compacts that come with this lovely set. Little kids love all of the different pieces and types of makeup. Pretending to apply make up will stimulate your child's imagination and creativity. 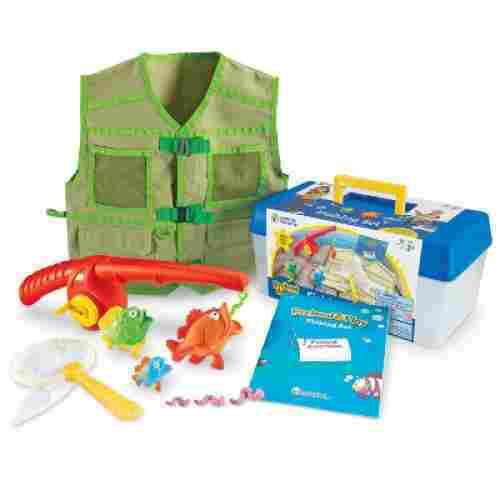 The set will encourage your little one to express themselves while increasing their fine motor skills. Choosing products for our list can be difficult because we research many products to bring you the best that we can find. For this list, we tried to find the best manufacturers who make the best toys that stimulate creativity. And the more of a variety of toys kids have, the better. It gives them multiple choices and experiences that they can learn from and input information to their small, but powerful brains. Pretending with toys that are colorful, have a number of pieces, and are well-built is important to engage kids in a variety of activities. The kinds of toys that kids interact with can bring out their creativity, their interests, and their development of relationships with others. The best toys are the ones your kids like, that match their interests and extend the use of a toy that he or she already has. Toys that can encourage a child’s imagination are the ones that fit a theme like shopping, fishing, going on vacation, or going to grandma’s. Toys can be simple for the younger folks, like a stuffed toy or big building blocks. More complicated toys work well too. Toys should be of different, attractive colors, have different textures, vary by hardness, be able to be used on land or water or both. Kids can get help from parents who want to encourage their kids to build their creative and cognitive skills. The trick is to provide your child with a larger variety of objects, toys, clothing, writing pads, books, blankets, and other things that can stimulate pretending. You don’t have to go out and buy a bunch of expensive new toys. They also don’t need the best electronics. Playing with ordinary objects found in the home, even old pieces, can bring about more fun play than a kid can handle. Provide a spot in the house to keep items your kids can use to build a house, like boxes and blankets. Toy dishes and other home objects can provide hours and hours of make-believe. With books, they can read to each other, or with flashcards, one can be the teacher and the other the student. As kids grow, they will become more and more adept at this and they will be asking you for all sorts of stuff. Studies show that children who are trained to play with pretend play toys are able to develop and strengthen their divergent problem-solving skills. Compared to convergent problem-solving toys where there is only one possible correct solution to a particular problem, divergent problem-solving toys allow creativity among children as they search for the best solution from a multitude of possibilities. This simply means that, given a particular scenario or problem, kids will be able to think of as many possible solutions they can. A classic example differentiating these two types of problem-solving toys are puzzles and building toys. A puzzle definitely has only one correct solution. If it does not fit the puzzle slot, then it is not the correct solution. On the other hand, building toys are open-ended. While building toys may have a predetermined design, it does not stop children from trying to figure out different configurations to the same problem. Hence, children using divergent play materials will be presented with a variety of solutions. This should help children choose the best according to the situation. Pretend play is a way for your child to discover that they can become anything they want. Their imagination can take them to any land they want to go to. This is something that can encourage confidence, and as they grow, they will mature into a person that can be empathetic to others. Eventually, they could even teach those skills to other kids as they play together. By playing make-believe games and telling stories by role-playing, kids learn how to handle emotions such as frustration and being frightened, for example. Parents and friends can play a role, too, by teaching how to problem solve so they learn and don’t get frustrated, but solve the problem instead. Kids learn new words as they play, as long as the words were/are taught to them. They learn them from parents talking and reading to them and from family and friends. As children play in their make-believe worlds, they talk to themselves or their dolls and practice putting words together in phrases and sentences. Parents can use objects and pretend play toys to teach kids to recognize what the objects are, and as they mature, they can start writing the words and even numbers. They learn colors, and numbers and words, using them more and more as they grow up. Kids are sponges at this age, and they can take in lots of information as they engage in more experiences, so as adults, we can give them what they can handle. A repetition is a good form of learning, too. Language gives kids power, and they learn this fairly quickly. Words and thoughts put together in pretend play can help kids think better as they learn to problem-solve. It helps them get to thinking about solving problems in the form of many different solutions. Kids learn to become creative in their solutions so they get much less frustrated, especially as they come out of the ‘terrible twos.” Better thinking, less frustration, better behavior. As kids grow and play with others, language helps her create stories with another child as they learn how to negotiate which roles each will play, switching roles, sharing toys, control of toys and the entire story. This helps them come up with solutions to problems and learning from and teaching each other. They act out make-believe events that go on in their own worlds. As they grow, they watch family and friends, and it gives them new material to be creative with. q: My family isn’t very creative. How can I be proactive and help my child become more creative? Try making your child a space in the house for some objects. You can keep it inexpensive by using boxes, plastic crates, an old telephone or phone book, clothes, fabric, pictures, anything like that. Maybe something theme related like dogs or horses. Then just let him or her go at it. Have your child tell you a story about one of the objects or ask what her she can do with it. With a blanket or two, he or she can maybe build a fort. Or invite a friend. They can play together and learn from each other. The possibilities are endless. q: How do I choose the right toy for my little girl? We can answer that with a few specific suggestions, but ultimately, it’s your choice. You should be matching toys with your child’s interests that will not be too hard or too easy for her. You will be able to tell if she likes it by how often she plays with it. If she likes it, then it’s probably the right toy for her. The pretend and play toys should encourage your child’s abilities to come out by offering several different ways to play with the toy. Play should be open-ended so that there are many scenarios she can make up. They should be interesting and engage several different senses. They maybe should both make sounds and be colorful. Or engage the sense of touch with soft and fuzzy textures along with saying some words. And it should fit your budget. 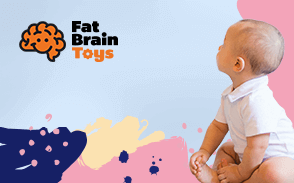 q: How will these toys help my son to develop physically? Most toys are multi-purpose, even simple homemade toys can be. That is good for your pocketbook and great for your son. That means his body can learn activities in the cognitive realm as well as the physical realm. The answer to this question depends a bit on your son’s age. Younger kids start out learning gross-motor skills, the basis of his growth in moving through his world. This includes arm and leg movements when he’s a baby, then crawling, walking, running, climbing, and so on. As you can see, there are toys for mostly ages 3 and up on this page, so they are past the baby stage and usually into walking already. So they can walk behind the shopping cart, hold the fishing pole or carry the tackle box. Fine-motor skills involve small muscles in the hands, feet, face, eyes, and elsewhere. Some of the best pretend play fine-motor developers are small objects like the fruits and veggies that can be picked up and taken out of the basket. Then put on the table or back in the basket. Kids can go on and on with just this one activity. Other supported skills include piling small items on top of one another, like the pizza veggies. The cash registers offer multiple ways to build fine-motor skills by picking up coins, pushing buttons, sliding a card through a slot, and many others. They also have noises that stimulate the sense of hearing and give children a chance to respond. There are lots of opportunities for your son to build on motor skills, both gross and fine. q: What are some benefits of pretend play for my toddler? Children love to pretend play because it’s so much fun. For toddlers, their imaginations can run wild. The more they engage in open-ended play, the better, and that is the basis for pretend play. Pretend play is important because it’s one way a child can learn about the world around them. They love to imitate others and this helps him learn what to do in identical situations. But the beauty of this is that as your child matures, he can create his own stories and problem-solving scenarios. This brings about experimentation with a myriad of solutions for each problem. This is about divergent thinking which brings about creativity. Creative people tend to be able to solve complex problems more easily and come up with lots of new ideas. This type of thinking also helps the child become more empathetic when playing with other kids or family members. Creating friendships is important in youth and this ability to play creatively and problem solve brings about the self-confidence a kid needs to be successful with relationships and job skills. q: My boys like to roll around on the floor a lot and tussle with each other. I would rather they played with pretend and play type toys and avoid the tussling. How can I get them interested more in pretend play? You can relax and take a breath. Boys who roughhouse with each other are carrying on quite normally. This can even be categorized as pretend play. They just may not be using a toy, and that’s ok. Tussling with each other is fine as long as you lay down some rules like no jumping off the couch and don’t get so rough that someone will get hurt. You have to teach boys how to keep their strength within certain parameters. Psychologists say that with playing rough, kids learn how to be cognizant of the effect of their roughhousing on others. Roughhousing with dad is great because he can teach your boys self-restraint and explain how being too rough can hurt people. Kids who aren’t taught self-discipline in these activities sometimes become adults who can't control themselves and end up hurting people in anger. So this type of play is something that boys need. If you think they are tussling too much, try getting them interested in any toys on this page. Ask questions about what they are both interested in. 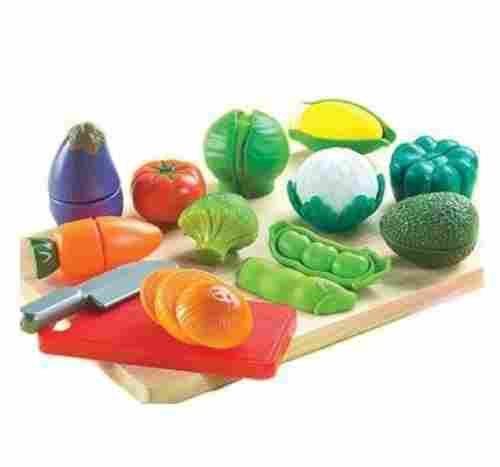 Ask questions about how they would use a toy like the veggies or kitchen set. Ask them to help wash the dishes, but then have them wash their own dishes together. Or get them to pretend to go fishing together. Find something they both like to do as an alternative to play fighting. And get them to help and teach each other. q: My daughter seems to get very distracted playing with her cash register. What should I do? In the short term, try giving her something a little simpler to play with. Toys with too many noises or lights, too many activities or even too many colors may just be too complex for her at this point. Try using simpler toys or turning off the sounds on the register. There is a benefit to simpler toys. They sometimes offer more opportunities for your child to use her imagination and create her own world. Try giving her some of your old dresses or shoes. Or maybe a box that can be painted like a house. Try a flat piece of cardboard with flowers on it or a bench where she can have a lemonade stand and just a cash drawer. Engage her with questions to help her use her imagination more than a toy.